For the past year or so, rather just concentrating on finding the lowest calorie products, I’ve been more interested in finding ‘healthier’ snacks which also happen to be lower in calories. With this in mind, I recently purchased another variety of the all-natural Castus bar. This one is called the Be Fruity with Fig fruit bar. It’s 100% natural with no added sugar and one bar = 1 portion of fruit. And the great news is it has only 70 calories. 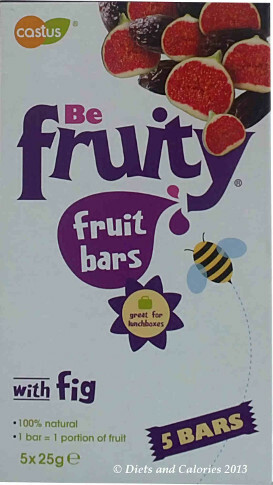 Be fruity bars are made from totally natural ingredients and are packed with sun ripened fruits. In this Fig bar the ingredients are dates (54%), figs (41%), vegetable oil and water, that’s it! Notice there are no added sugars. These fruit bars can be eaten as part of a healthy diet, contributing to your 5-a-day, any time of the day. I like figs, especially dried ones. But they can be quite tough to eat and once the pack is open, they usually have to be eaten in a few days. I don't want to do because they’re high in calories. It’s all that fruit sugar condensed into a tiny portion. And of course they have a high GL. The Be Fruity bars are a great alternative to eating dried figs and dates. They’re in an easy to eat bar form, enclosed in a wrapper so you don’t need to get your fingers sticky. The bar itself is bendy and squashy, a similar texture to a date. It’s full of crunchy fig seeds with a lovely fig flavor. Also, you can break off as much or as little as you want to eat in one go. They’re really high in fibre too, so if you need a little help in that area… these bars may be worth trying. They’re also perfect for lunch boxes. I’m always trying to find health snacks for my kids and they would refuse point plank to eat a fig or a date, fresh or dried in its natural form. Apparently these are a New Improved recipe, but I can’t vouch for that as I’ve never tried the old version. But these are every bit as good as the strawberry bars I reviewed in this earlier post. In fact I prefer them. You can also buy them in Apricot variety. Some supermarkets sell them from time to time i.e. Tesco or Sainsbury. But you can usually always find them in health food shops, Holland & Barrett and Amazon. Nutrition Information per bar: 70 calories, 0.8g protein, 15g carbs, 14g sugars (naturally occurring), 1.5g fat, 0.6g saturates, 3.5g fibre, 0.1g sodium.